www.baec.gov.bd notice board published new job circular about Engineer and Medical Officer Post. Bangladesh Atomic Energy Commission job circular published by Daily Newspaper Bangladesh Pratidin. Application Last Date for baec and Application form are available at www.ejobscircular.com . See below for more information about Bangladesh pormanu sokti commission 2016. See below this image for Educational Qualification, Age Limit, Salary etc..
Bangladesh Atomic Energy Commission Vacancy notice updates or Result are published on my website. Keep visit this Website for Next Updates about Baec.gov.bd . Thanks for Stay with us. 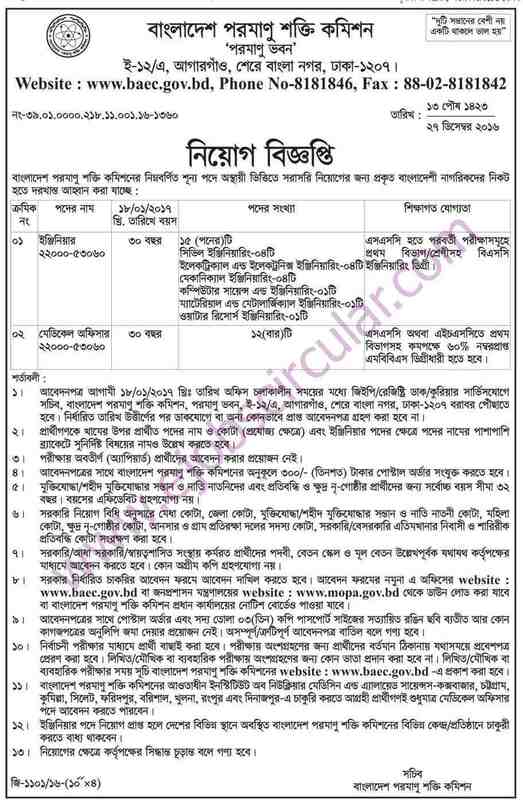 This entry was posted in Bangladesh Pratidin, BD Govt Jobs 2019 and tagged Govt. jobs by ejobscircular. Bookmark the permalink.